In recent years, Barton F. Graf 9000 has created some hilariously absurd and sometimes controversial commercials for Kayak. These two new ads are more subtle and less flat-out wacky, but still take viewers on pleasantly off-kilter trips. "Breakup" finds a recently dumped boyfriend pouring his heart out to a neighbor, who admits to experiencing the same issues … with travel sites. Buck up, Romeo, there are plenty of fish in the sea! 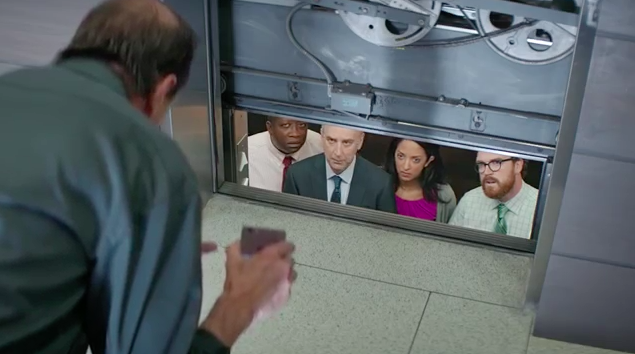 In "Elevator," an office-building maintenance engineer tells some white-collar types, who are trapped in a lift, how Kayak helped him search for a hotel. Alas, Kayak won't help them get free anytime soon. Take the stairs next time, people, and burn some extra calories! True, Kayak can't solve everything, which is a more refreshing message than brands who claim they can deliver the world.